Bestproxyandvpn Review 2019 - Is It the fastest dedicated proxies? BestProxyAndVPN is a premium proxy provider with products ranging from elite anonymous HTTP/HTTPS/SOCKS private proxies to VPNs. With many available server locations, high-speed performance and great customer service, BestProxyAndVPN is an excellent choice for your proxy needs. Read our expert review on their service. Recommended for:SEO data scraping, craigslist. Proxies are everywhere in the internet, and all of us have used it by knowingly or not. But private proxies are not something that you just stumble upon. Instead, private proxies are used by advanced users for specific purposes. Know more about the private proxies! If you are one of them and are looking for suggestions on which proxy service might be good for you, you have come to the right place! In this review series, our expert reviewers are reviewing some of the most popular private proxy services currently offering private proxies to be used on the internet. Since we had started reviewing different proxy services, we have repeatedly seen the name BestProxyAndVPN pop up in many forums by many users for their go-to solution when looking for a proxy provider. We have recently reviewed their private proxy service to find out the reason behind the hype and turns out it’s not wrong! The proxies provided by BestProxyAndVPN are really up to the mark and of premium quality. Read on to find in-depth details on their service and performance. To review the service of BestProxyAndVPN, we bought their package of six private proxies and tested the proxies for review purpose. While reviewing, we emphasized on the proxy parameters such as speed, ping, geolocation, and IP compatibility. During the review process, we also reviewed their service to find out how user-friendly it is. We have summarized the pros and cons of the service in a table below for your convenience. The proxies are classified as high or elite anonymous. All proxies are dedicated and private only to you. Offers both HTTP/S and SOCKS protocol. Proxies can be replaced once each month. Instant delivery of proxies for verified PayPal accounts. Either IP Authorization or username-password authentication can be used for authentication. PayPal, Payza and Credit cards (via 2checkout) are accepted as payment methods. High ratio of bad proxies. BestProxyAndVPN, as their name suggests, offers both proxy and VPN services. However, all of their proxies are private proxies, and they do not offer any shared proxy plan. In this review series, we will keep our discussion limited to their proxy service and will not focus on the VPN service. The proxies provided by BestProxyAndVPN are classified as elite class high anonymous private proxies. This practically means that the proxy request generated by the proxy server replaces your PC’s IP address in the HTTP header file with their server IP and doesn’t include any of the forwarding protocols. This makes you appear as browsing the websites from their server locations with the masked IP address. BestProxyAndVPN also offers SOCKS 4/5 proxies as well as HTTP and HTTPS proxies. The pricing plans are very straight-forward. There are only six packages with monthly subscription and one with weekly subscription. However, the pricing is among the most expensive we have seen so far. BestProxyAndVPN has one of the widest range of locations provided by any private proxy service. With servers in over 80 cities covering many major countries, BestProxyAndVPN boasts their premium proxies. 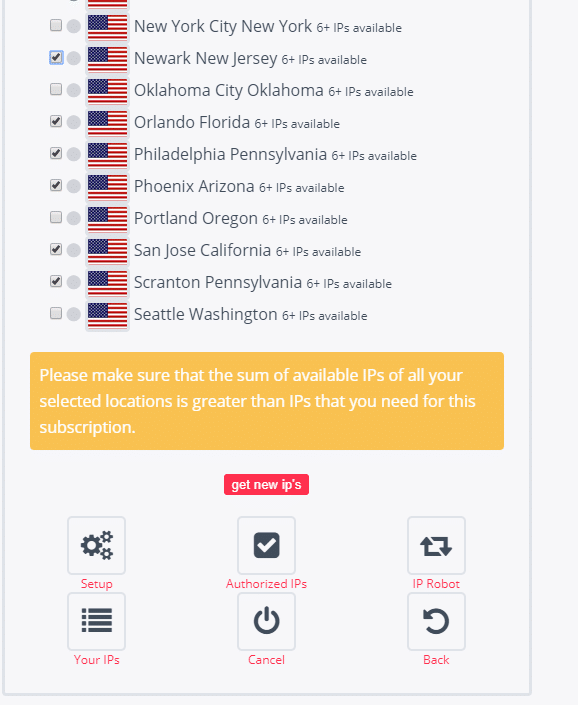 For any proxy packages with more than 6 proxies, you can choose as many locations as you like. BestPrxoyAndVPN has servers in Australia, China, Hong Kong, India, Indonesia, Israel, Japan, Singapore, South Africa, Canada and almost all major cities in EU and the USA. So you can be pretty confident that they will cover your specific proxy location requirement should you have any. You can also check the whole list of their server locations here. You can also choose the specific cities you want the proxies from while choosing your plan or replacing your proxies. This is pretty handy if you need to access sites from specific cities due to location constraints or an added advantage. This is also helpful while buying tickets, social media promotions or craigslist posting. To review the proxy service offered by BestProxyAndVPN, we purchased a package of 6 private proxies from BestProxyAndVPN. We performed some tests on the proxies that help us determine the proxy quality and suitable application of the proxies. The first of the four tests was the ping test that checks the connection establishing time required by the proxy server. Ping is an important parameter of any proxy service since this gives an idea of the delay introduced by the proxy server. If the ping time is much high, you might experience significant laggings while browsing. Since packet loss is also associated with high ping, proxies with high ping are also not suitable for bots. We used whoer.net, an online tool to check ping to a server from various locations, to determine the ping to the proxy server from three different locations, Georgia (USA), Quebec (Canada) and London (UK). As you can see from the test result below, the ping is higher when the distance between the server location and testing location is greater and vice versa. The ping result is satisfactory since all of the tests have lower than 200 ms ping duration. This lets you have a smooth browsing experience while browsing the internet. However, two of the proxy servers were irresponsive during the testing which is not much positive. The detailed result of our ping test can be found below. Good ping is of no use if the proxy server cannot deliver the data fast enough. For this, we need to test the speed of data transfer as well, which is the third of our tests. To check the speed of the proxies, we first activated each of the proxies. Then, we tested the data transfer speed using the number 1 online speed testing site on the internet, speedtest.net. This let us have an authentic result which can be trusted easily. The test result was somewhat satisfactory. One of the given proxies was a bad proxy and didn’t connect to the servers at all. Out of the rest five proxies, the speed was only 5 to 15 Mbps, which is okay for general browsing but may not be suitable for video streaming or similar high bandwidth tasks. You can see the complete results below. We perform the geolocation test to verify if the proxies are from the location as mentioned by the proxy service. As such, we performed the test on all six proxies we purchased from BestProxyAndVPN. In this test, we checked the geolocation data of the proxy IPs from two geolocation data provider using an online tool, iplocation.net. The site aggregates geolocation data from some major location testing companies and displays in a convenient table. It also includes information about the ISP and the organization. Since the proxies are non-sequential and were provided from the locations we requested, we’d say the test result is pretty good. You can see the test result from our test below. IP compatibility is an issue that many faces, since often proxy providers restrict access to certain websites so that they can charge a tariff for those websites. This technique is usually not seen in the proxy services that do not offer specialized premium packages. While BestProxyAndVPN doesn’t offer any specialized proxy packages for sneakers proxies, we found Adidas site not working with their proxies. However, other major websites that we tested were working fine. 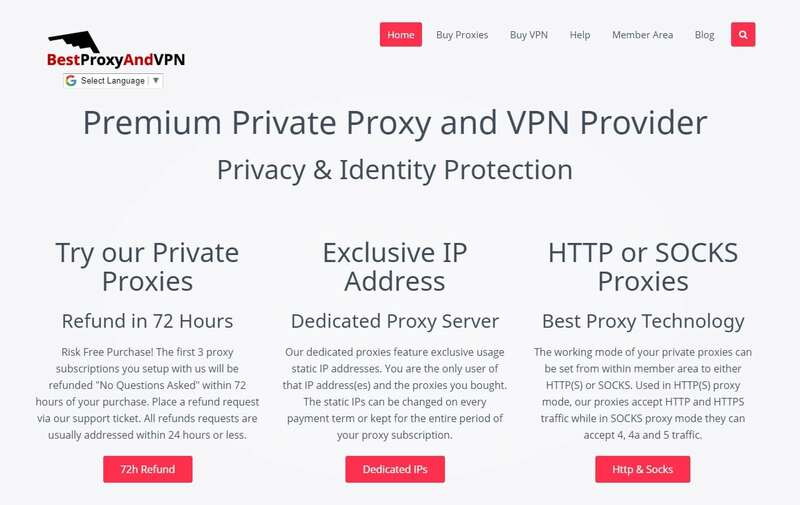 BestProxyAndVPN offers premium quality HTTP/HTTPS/SOCKS proxies that are highly anonymous. The SOCKS protocol support both SOCKS4 and SOCKS5 while the HTTP/S proxies support IPv4 protocol. BestProxyAndVPN supports dual authentication methods. You can authenticate your login with either username and password or by authorizing IP address. One of the best features offered by BestProxyAndVPN is that you can choose proxies from any location from their vast list of available locations. This is a feature that is offered by very few proxy providers. Even better, you can choose your own set of locations during proxy refreshing too. So, if you change your mind or have new requirements, then you have a solution at hand. You can request for a refresh of the proxies each month for no additional cost. If you have troubles with any of your proxies, you can change the proxies easily from the control panel. During the refreshing, you can choose the new IPs from the available locations. If you complete your payment via PayPal, you will instantly receive your allocated proxies in an email. In fact, it took only five minutes for us to receive the proxies and start using them! For other payment methods, it may take anywhere from 2 hours to two days for verification purpose. BestProxyAndVPN has one of the best refund policies out there. Their policy states a 72 hours refund period for first 3 subscriptions with no questions asked. This ensures great customer satisfaction and also proves their confidence. BestProxyAndVPN offers dual authentication method which enables you to use the service at your convenience. You can use the proxies as a system-wide proxy by entering details in the system proxy settings or you can set up the proxy in individual programs. You can set your proxy authentication mode to either username-password verification or IP authorization. 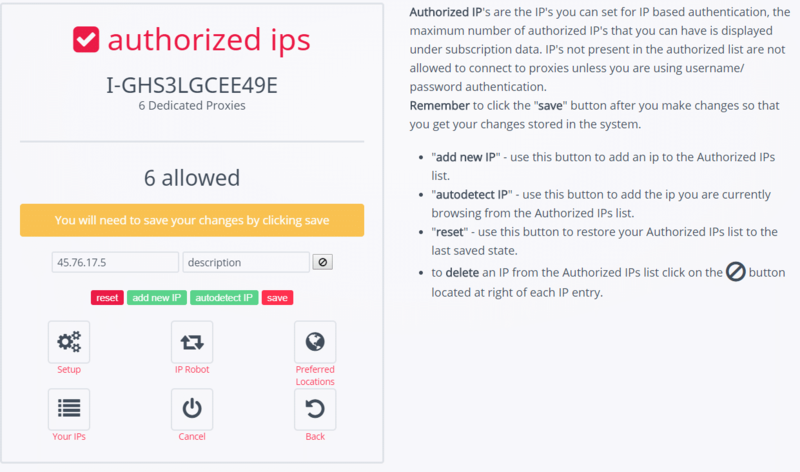 You can authorize up to six IPs to be used for logging in. BestProxyAndVPN is a company that puts customer satisfaction first and thrives for excellence. Their feature packed proxy service is a great solution to those who are struggling to get a decent proxy service. They have an impressive collection of server locations that is hard to rival. They need to work on improving the server speeds so that the proxies can be used for a diverse range of tasks that require high bandwidth. While the price is certainly not in the category of being inexpensive, the premium proxies offer many features that make the service excel. If you’re not on a budget constraint and you’re willing to pay a bit more than the other cheap proxies out there, you should definitely check out BestProxyAndVPN.